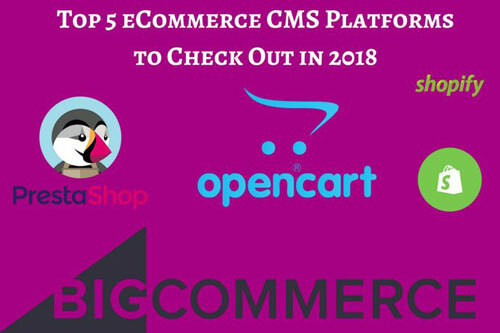 ﻿ 5 Best eCommerce CMS Platforms to Build Online Store in 2019! The fastest growing industry online is eCommerce. Selling everything from apparel to electronic, eCommerce sites have caught on because of their convenience and economy. Consequently, the competition among these sites is intense. Each site must not only develop a user friendly experi-ence, it must have the support of an extremely efficient CMS. With a constantly moving inventory and the need for a dynamic site, content management in eCommerce is an absolutely essential element. An ideal CMS should work on both ends of the spectrum — ensuring a smooth buying experience for the consumer, while creating an impressive support system for the seller. There are two types of eCommerce platforms to choose from: hosted and self-hosted eCommerce platforms. Emerging as one of the clear winners, Shopify has a dedicated fan following. With its ready-made theme, it is ideal for people with little design experience. While it has enough support for a novice, it also has customization tool to ensure that every website retains the sellers individual choice in the way it looks and interacts. Apart form customization, Shopify also has provisions to accommodate future growth by allow-ing you to add new channels quickly and efficiently. The user experience has been made equal-ly efficient on both ends. Shopper experience is quick and efficient, while sellers can also easily track purchases and trends. The platform also supports multiple payment options as necessitat-ed by any eCommerce website today. One of the most popular eCommerce platforms across the world, Big Commerce supports a range of business from equally diverse locations. It boasts of an efficient and easy-to-use CMS that can be set up in no time. The user-friendly admin allows enough flexibility to manage prod-ucts and services. There are multiple options in marketing methods as well as a drag-and-drop widgets. Various tools and applications help you customize the site. As a CMS, Big Commerce has many advantages that make it among the top platforms, includ-ing SEO friendly framework, built-in analytics, options for social sharing and a number of cus-tomer interaction tools. Among the self-hosted platforms, Magento may well emerge the winner. This open-source plat-form prides itself on its agility and its is this feature that gives it the flexibility one needs in the dynamic world of eCommerce today. The popularity of Magento web development services has given it its own stregnth. It now has the ecosystem more than 150,000 developers as well as over 300 trained solution partners. The CMS offers tested plug-ins, allowing users a complete flexibility in managing their look, content and functionality. Its mobility across devices, a flexible pricing regime (including free versions), automatic updates, easy to use functions and advanced SEO has made it one of the most popular eCommerce CMS in the world today. The fact that Open Cart is free undoubtedly is one of its USPs, but it is not the only one. The open source platform offers free updates and no expense in monthly fees. But it is also quite easy to develop and use — two essential requirements for a self-hosted CMS. Based on the MVC pattern, Open Cart only needs knowledge of PHP and MySQL. The superior UX with an easy to use dashboard that is very user-friendly. Apart from its own support team, Open Cart also has a pretty active community. Combined with almost zero developmental costs, PrestaShop is also among the easiest plat-forms to work with, thanks to its easy to use administrative dashboard. It is easy to follow and allows you complete customization. Backed by a website builder, it has a number of tools and features that add to its functionality. But PrestaShop is also geared more modern marketing essentials — mobile-friendly as well as SEO support. It allows for multiple payment options and a smooth checkout. With the right ad-ons, you can also integrate it with other eCommerce sites to expand your market!